The BMW 5 Series was the first model to introduce the controversial ‘flame’ design which split opinion. However we have always been fans so we were keen to see if the latest design would also hit the spot. We think that BMW has got it right again with a dynamic and thoroughly contemporary design which keeps the 5 bang up to date. The new 5 Series comes with an array of EfficientDynamics technologies. There’s Auto Start-Stop, optimum gearshift indicator, Brake Energy Regeneration, Active Aerodynamics and low rolling resistance tyres. In addition a state-of-the-art 8-speed automatic transmission with a longer final drive ratio to reduce engine revs at motorway speeds helping to achieve great fuel consumption. In the driving stakes BMW has kept the trademark 50:50 weight distribution, which along with the front-engined, rear-wheel drive layout, makes the 5 Series more agile than rivals. There’s also no reason to expect anything other than the excellent build quality that we’ve become used to. 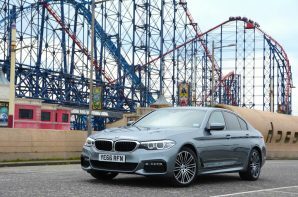 The latest 5 Series is evolutionary rather than revolutionary but when you’re starting so close to perfection that isn’t necessarily a bad thing. The 520d ED delivers strong real world performance whilst achieving fuel economy that shames many city cars. With a brilliant blend of quality, style, performance and driving entertainment, it remains our favourite executive car.